Bachman's Warbler aka Bachman's Swamp Warbler (Vermivora bachmanii) was a small passerine bird that inhabited the swamps andlowland forests of the southeast United States. This warbler was a migrant, wintering in Cuba. This bird was discovered in 1832 by the Reverend John Bachman, who presented study skins and descriptions to his friend and collaborator, John James Audubon. Audubon never saw the bird alive but named it in honor of Bachman. 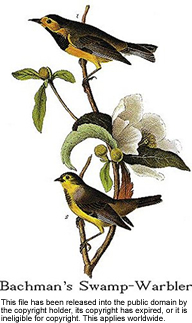 Audubon's folio renderings of a male and female Bachman's Warbler were painted on top of an illustration of the Franklinia tree first painted by Maria Martin, Bachman's sister-in-law and one of the country's first female natural history illustrators.